How to Get an Alabama Fishing License? Well, are you planning for Alabama fishing? Maybe, you already know what you need. A Fishing license Alabama is the first thing you should obtain. The people in Alabama aged between 16 and 64 require a valid Alabama fishing license to fish with a rod and a fishing reel or an artificial bait. Likewise, you need this license to fish with hook and line also outside your county of legal residence. However, you will need no license if you fish with only hook and line and without the rod and fishing reel. For fishing with rod and fishing reel, you will need an Alabama fishing license. This article will guide you to know everything to get an Alabama fishing license. You can get an Alabama fishing license if are between the age of 16 and 64. If you are above 64 or under 16 years of age, you are not eligible to get an Alabama fishing license. Alabama fishing licenses that are for one year only expire on August 31 each year, and you will have to renew it on September 1. You can also apply for and buy an Alabama lifetime fishing license if you are a legal resident of Alabama. This lifetime license does not expire and require renewing. All non-residents between the age of 16 and 64 must have a license to fish in the state of Alabama whether with a fishing reel or hook and line. Non-residents of Alabama can also get an Alabama freshwater fishing license or an Alabama saltwater fishing license for seven consecutive days. You can get a non-resident license at the Courthouse of Alabama or any satellite office in Alabama. 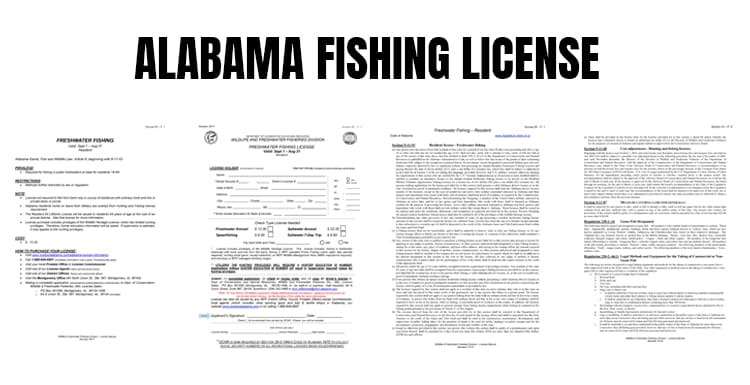 You can also apply for an Alabama fishing license online if you are a resident of Alabama. Apply here. To apply for the Alabama fishing license, you will have to show a valid Alabama driver’s license or an insurance license as a proof of your residency. Note : A non-driver identification card from the Department of Public Safety is not accepted as a proof of your residence. No non-resident will be issued an Alabama fishing license under the residence rules even if s/he produces 2 of the above items. Fishing with baitcasting reel or any other advance accessory is prohibited in Alabama if you don’t have a valid Alabama fishing license whether you are a resident or not. So, you must get a license before you go fishing.